I m offering my freelance project services to you. 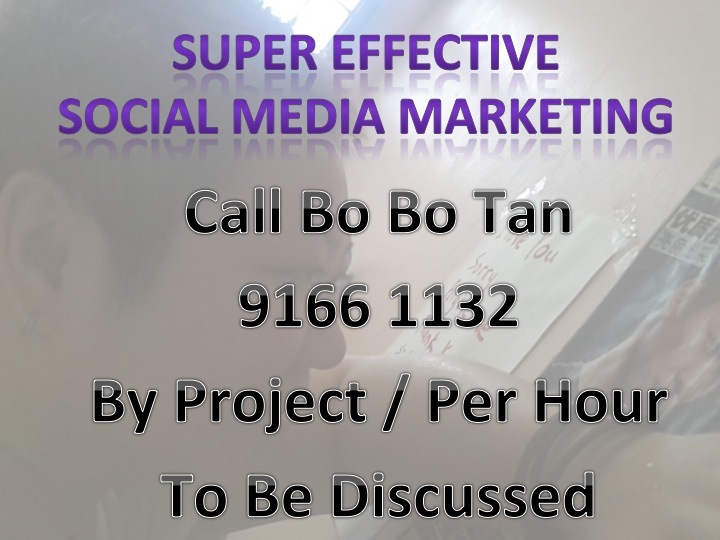 You can engage me to do your projects. Pay per project can be from $50 or above. Subjects to the difficulty of your projects. EG. Data collection/ Leads collection/ Power Point Presentation/ Assignment/ Facebook Page Monitoring/ Website Monitoring/ etc. Please call me at 91661132 to discuss. You know me as Tan Lobangqueen Bobo but do you know I m also Roadshow Queen. Haha. The hit rate of getting leads and sales is always high. But don’t ask me to sell slim products unless you want to sponsor me to become slim. Don’t ask me to sell skin care products unless you pay to make my face smooth, call me if you want to engage my professional service for roadshow. Only for weekend and by project basis. Call 91661132 to discuss the rates.